Auctions are already gaining momentum on the residential end, and commercial property owners in New York City are also starting to turn to them to unload properties. 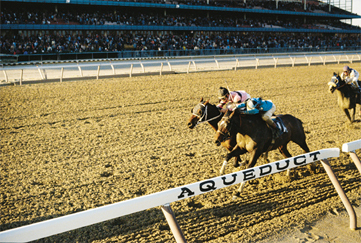 David R. Maltz & Co., a Plainview, NY-based auction company, is slated to auction 64 surplus tax lots owned by the New York horse Racing Association in Ozone Park, Queens, near the Aqueduct Racetrack on May 13. The parcels, which the NYRA has owned for more than 20 years, range from 2,000 to 75,000 square feet and are mostly in residential developments. The company is also readying to conduct an auction for a 25,000-square-foot industrial building in Ronkonkoma, N.Y. While in other cities commercial buildings have been purchased at auction, no major office buildings in Manhattan have yet been auctioned, said Richard Maltz, vice president for real estate at David R. Maltz & Co.
Officials at the company and auction house Sheldon Good & Company say most of the commercial auctions so far have been for residential properties with multiple units, including condominiums, townhomes and single-family homes. Michael Fine, director of marketing for Sheldon Good, said auctions will soon be popular in Manhattan. Sheldon Good will soon auction 30 condos, available in bulk or individually, in a Weehawken, NJ development, a 75-acre home development in Tarrytown, N.Y. and a two- to three-acre property in Larchmont, N.Y., approved for condos. New York City home sellers have already become familiar with the ways of the auction. The huge glut of condos around the country is being worked off through auctions. Recently, California-based real estate auction marketing company Real Estate Disposition recently auctioned more than 375 foreclosure properties in the New York City metropolitan region, northern New Jersey and northeastern Pennsylvania at the Jacob Javits Convention Center.